It's time for our monthly MFT Design Team Creative Challenge. 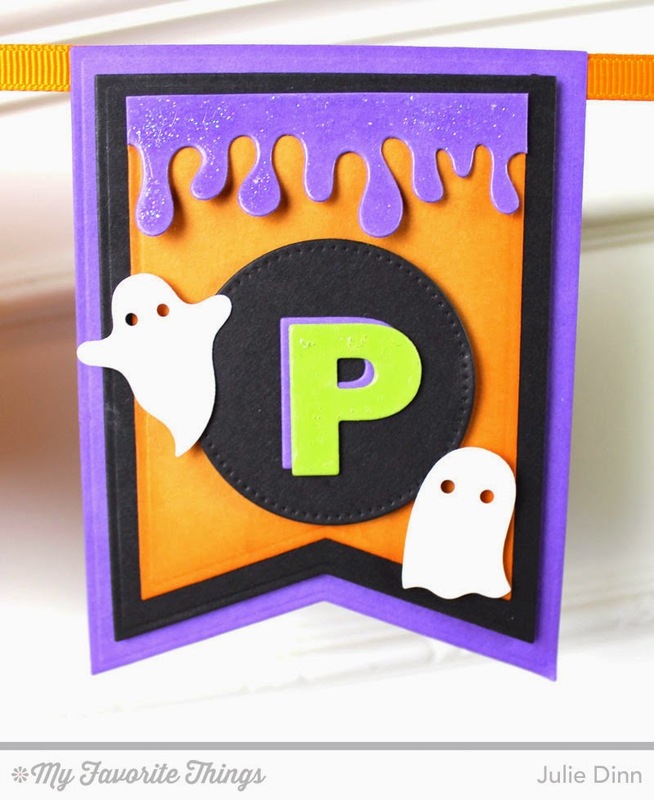 With Halloween right around the corner, we are sharing some ideas for Halloween card, treats, and home decor. 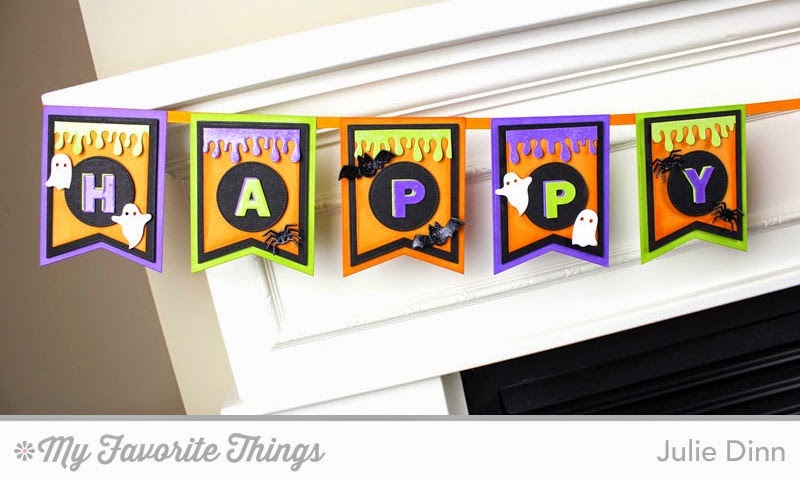 I decided to create a bright and colourful Halloween Banner that my little friends might enjoy. The banners were created with the Jumbo Fishtail Banner STAX Die-namics. I picked four basic colours for the banner, Black Licorice, Grape Jelly, Orange Fizz, and Sour Apple. I alternated amongst the Grape Jelly, Orange Fizz, and Sour Apple for the large banner pieces. The middle and top banner pieces were all done in Orange Fizz and Black Licorice. Along the top edge of each banner piece I added some sparkling, dripping, goo. The goo was created with the Dripping Goo Edge Die-namics and the Sheer Sparkle Glitter Glaze. The letters were die-cut with the By the Letters Uppercase Die-namics, the circles were die-cut with the Pierced Circle STAX Die-namics. To give the letters a little extra texture, they each received a liberal coating of Crystal Effects. I added a few bats, spiders, and ghosts to finish off the banner. 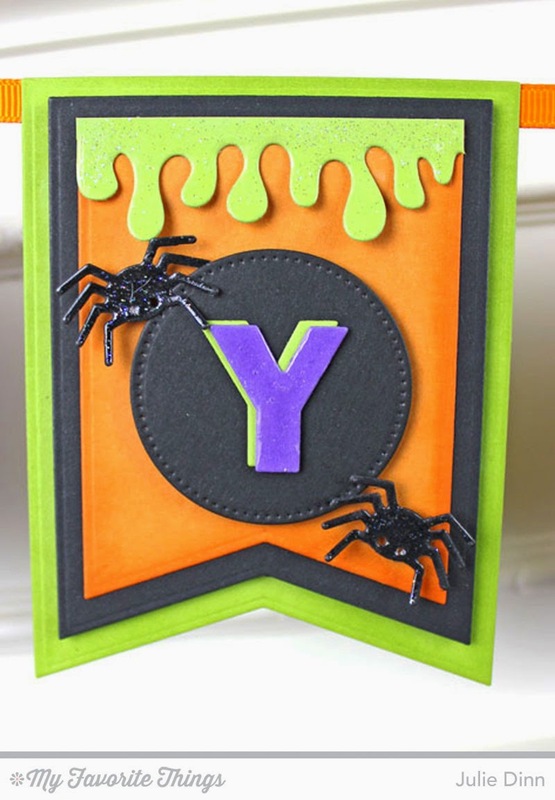 The bats and ghosts both came from the Spooky Scene Die-namics, the spider is from the Centerpieces Spooky Window Die-namics. The banner pieces were attached to a piece of 1/4" grosgrain ribbon. 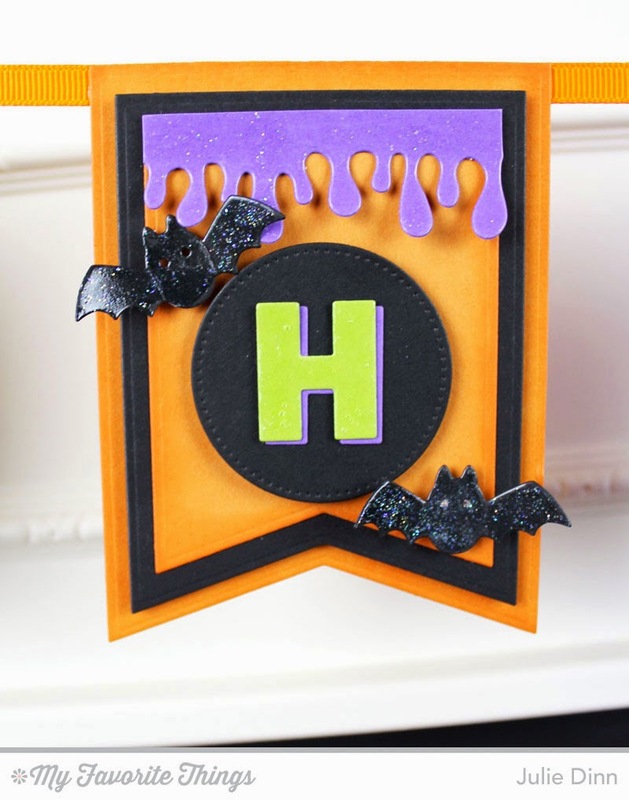 Be sure to check out the MFT Blog to see what Halloween treats the Design Team has in store for you today. I have one more set of Halloween treats to share with you on Friday and then there will be a whole bunch of Christmas everywhere on the blog for the next few weeks. I LOVE this Jules! LOVE! The dripping goo is PERFECTION and the colors just scream Halloween!! LOVE!